After a brief break, the Senate Special Select Committee resumed its investigation into the Auditor General’s Special Audit report on Wednesday, April 26th. The Committee continued its inquiry into allegations of corruption at the Passport, Visa, and Nationality Departments between 2011 and 2013. During the interrogation last week, three persons sat in front of the committee to give their testimonials. The report from the Auditor General documented that in late 2012, eight visa stickers were removed from the Immigration Department at the Belize Western Border. The report states that the stickers were handed over to a supposed visa agent only known at the time as ‘Mr. Middleton.’ Later it was revealed that his full name is Barton Middleton. Allegations maintain that Middleton sold those visas to the Belize City Council Financial Controller, Patrick Tillet, and former Belize City Deputy Mayor Eric Chang. However, after finding out that the visas could not be used, Tillet and Chang tried to get their monies back, but to no avail. When both appeared in front of the Committee for questioning, Tillet confirmed that he was paid $5,000 to process visas for some Chinese nationals and more than half of that amount went to Middleton. However, Middleton could not be found at that time for questioning. His whereabouts were finally revealed by a senior immigration officer, and when he was questioned, Middleton was reluctant to comment because he was fearful for his life. In response, Committee Chairman, Aldo Salazar warned Middleton. “We have decided that we will hand over all information and evidence that we have to the office of Director of Public Prosecutions,” said Salazar. The same warning went to two other witnesses that were interrogated that day: former data entry clerk at the Immigration Department Omar Philips and Theresa Chavarria, retired Immigration officer. 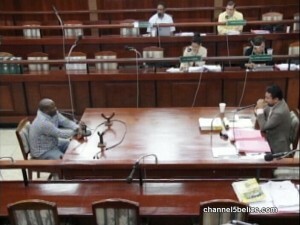 Philips ended up before the Public Service Commission over South Korean fugitive Won Hong Kim, who obtained a Belizean passport while in a Taiwanese prison. Philips argues that the front desk clerk relies on the authenticity of the birth certificate or the nationality certificate, when processing an application. He was asked if he was trained to detect irregularities in documentation. Philips stated that he was taught to accept the application form and save data. Before the inquiry ended, Chavarria noted that it would be difficult for any authority to notice any flaws in the passport picture. She stated that in a legitimate situation, there would be no issues. 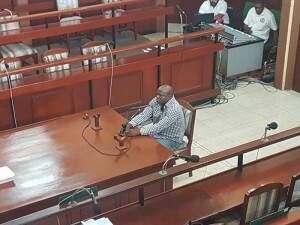 The Senate hearing continued on Wednesday, May 3rd, with the interrogation of Rodolfo Bol Jr., Information Technology Manager at the Immigration Department. This was his second appearance in front of the Senate Special Select Committee. At his prior appearance he contended that it was impossible to falsify a picture into the immigration system. However, after it was contradicted by Chavarria, Bol told the Committee that he was unaware of those circumstances.